In my home, it is understood that my near-reverence for bridal gowns is to be treated with good humour and a generous dose of patience. I am helplessly drawn to a standstill each time I pass by a boutique with wedding gowns on display and who can blame me. To me, these perfect concoctions of lace and tulle and all sorts of lush fabrics are undoubtedly woven from someone’s dreams. 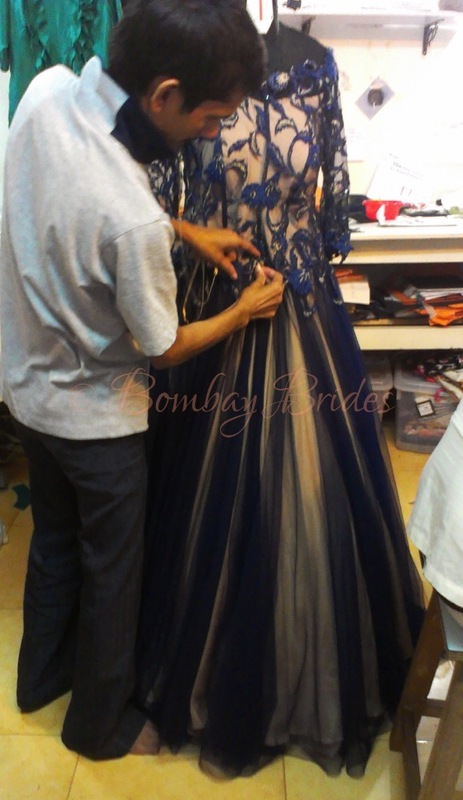 The fascinating Michelle Rodrigues is one such dreamer and Bombay Brides couldn’t be more excited to present her as the first ever seamstress to feature on this site. 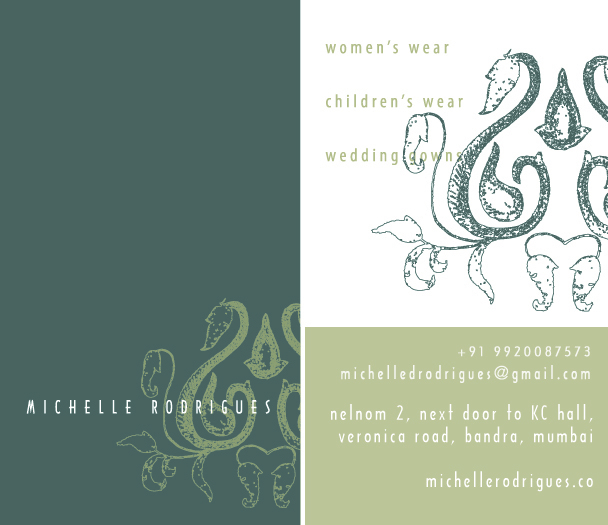 Operating under her label Michelle Rodrigues, this Bandra girl fills her boutique on Veronica Road (Bandra West) and the nearby workshop where she teaches design with creations that speak of her lifelong fascination with clothes and the simple joy of creating them. 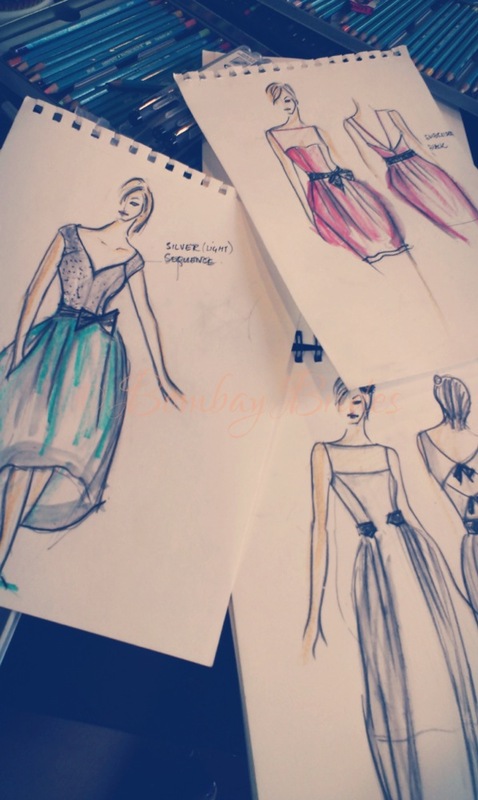 Trained as a designer and pattern-maker at Sophia College and SNDT, Michelle loves making clothes and fashion illustration. 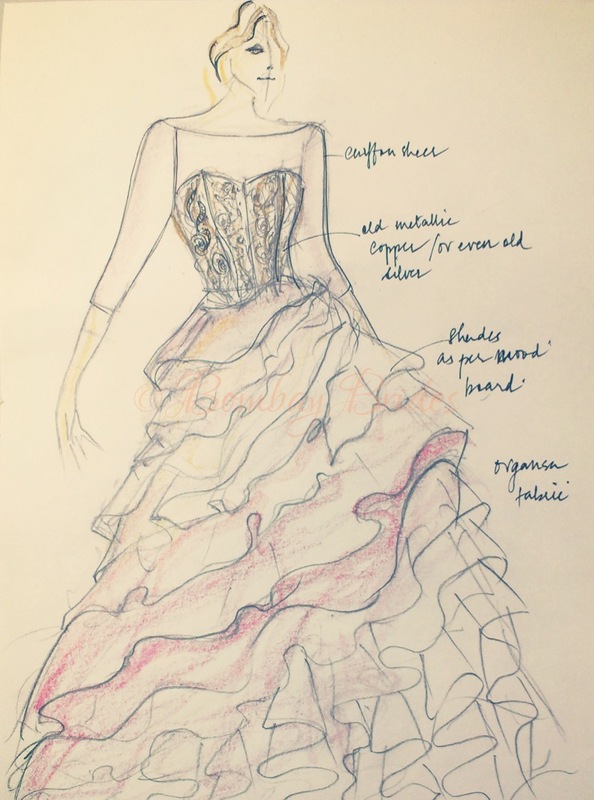 Her journey began in grade eight, when she began to show an interest in pattern-making and sewing clothes; but it was in reality a sense of frustration with the tailors who were unable to do justice to her designs and sketches that had Michelle give a serious thought to taking up the needle. Willing friends and sisters – Michelle’s first clients, kept her supplied with enough fabrics and opportunities to experiment with styles and perfect her fledgling hobby. She moved on to learning a wider variety of cutting styles from her teachers and threw herself headlong into drawing, sewing and everything related to the art of dressmaking in the following years. Post-college, Michelle spent a decade in Muscat, where she taught design at a university and ran a clothing workshop and experimented with Arabic design and fabrics. By 2011, she found her way back to Mumbai where she took up research in cultural theory related to dress-making. Michelle was ready to start her own brand of women’s wear. Her own wedding gown sparked Michelle’s foray into Western bridal wear. In her search for seamstresses to stitch her a strapless bridal gown, she was told by one that while the gown would be strapless, it wouldn’t be possible for her to guarantee that it would stay up. A disbelieving and determined Michelle took it upon herself to prove the seamstress wrong and went on to stitch her own wedding gown. 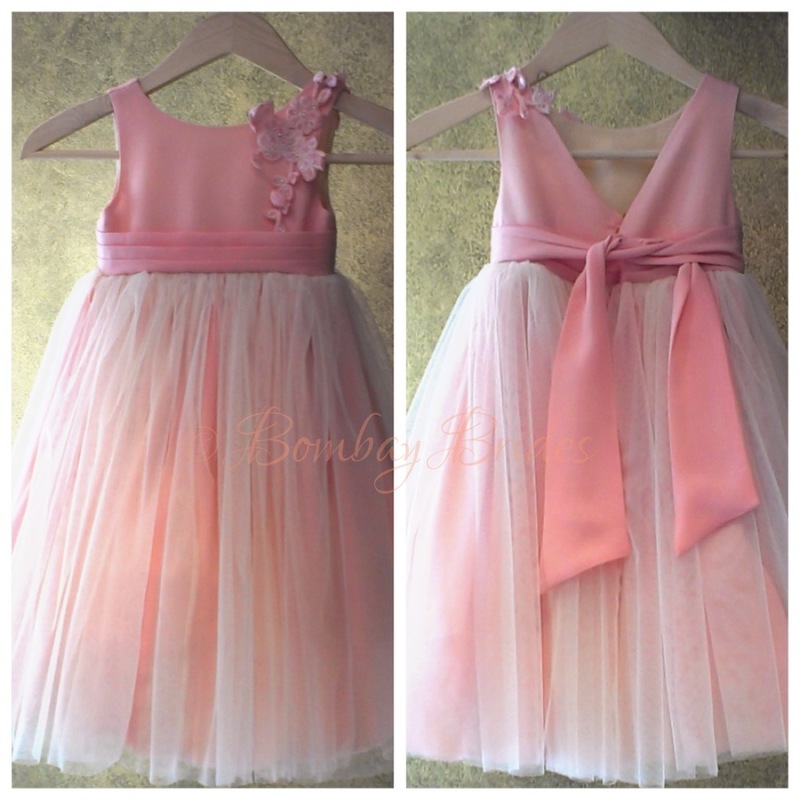 From special occasion dresses, flower girl frocks and bridesmaids dresses to bridal gowns, Michelle has been creating bespoke bridal wear for more than three years. Today, Michelle Rodrigues’ cutting style and design sensibilities stand out like a breath of fresh air in Mumbai’s budding but limited market of original Western bridal wear. Textures (particularly embroidery and lace) inspire her and the wedding dresses she designs, allow her to indulge her creative side. Where the dresses she designs are concerned, Michelle favours a minimalist design sensibility; her signature style emphasising structure and clean lines. Silk is the fabric she loves to play around with the most and relishes watching the brides who come to her studio for their wedding gowns fall in love with the expensive and extremely attractive Chinese, Swiss and Chantilly laces. While her favourite cuts do play an important part in the design process for a bridal gown, Michelle is one of those seamstresses who seamlessly adapt to the bride-to-be’s tastes. She firmly believes that wedding gowns ought to reflect the personalities of the bride and that her duty is in helping them express it best in aesthetics and form. A fan of the vintage bridal aesthetic, Michelle hopes to see (and be instrumental in) designs from the 20s, 30s, 40s and the 50s make a comeback in Mumbai’s Christian bridal scene. The cathedral look with delicate lace detailing and the trumpet silhouette especially are already finding themselves back on the block. “The trends in Mumbai over the past three years, have been rather conspicuous. Three years ago, the heavy draped and layered Vera Wang inspired dresses were sighted. 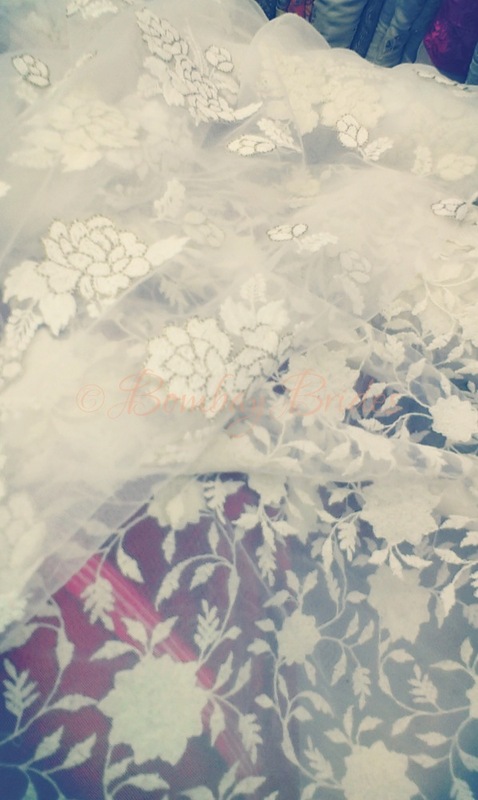 The last couple of years saw tulle make a comeback, and with it, the princess look (feathers, bling and flowers). Taking on clients on an appointment basis months before the wedding season starts, Michelle and her team of skilled tailors take anywhere between 6-8 weeks to work on a bridal gown. 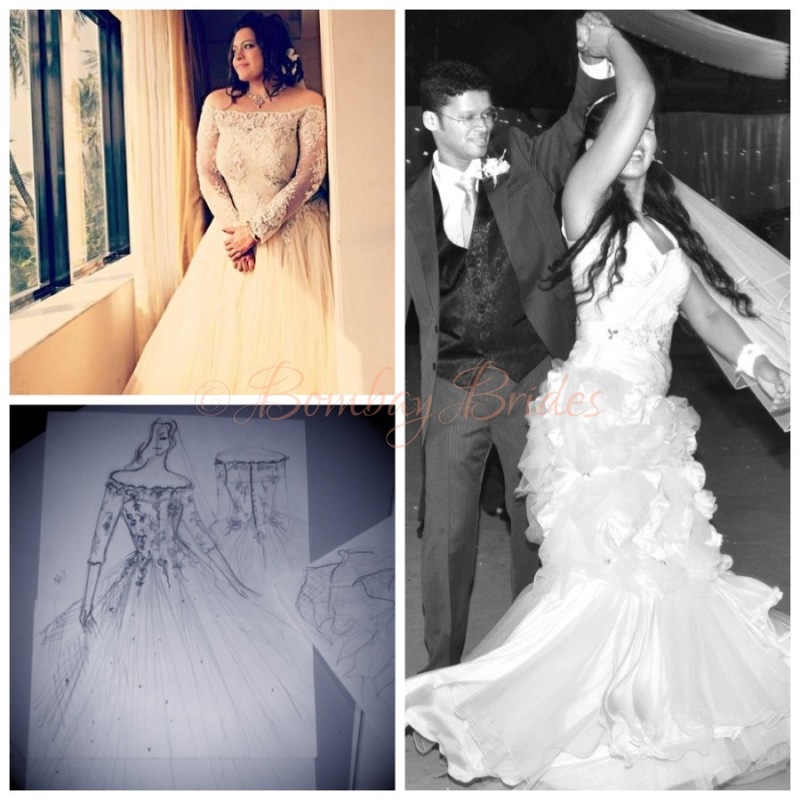 The sewing and fitting processes are extremely personalised and Michelle accompanies the bride to purchase the fabric. Cutting each dress after carefully understanding the bride’s figure is also her responsibility and Michelle follows it with a toile fitting and three more fittings before the gown is ready for the bride to wear. Walk into her studio on Veronica Road, and one will find clothes for the bridal entourage, the mother-of-the-bride/groom, cocktail dresses, Indian wear (including sarees) and even her own line of ready-to-wear and handbags. 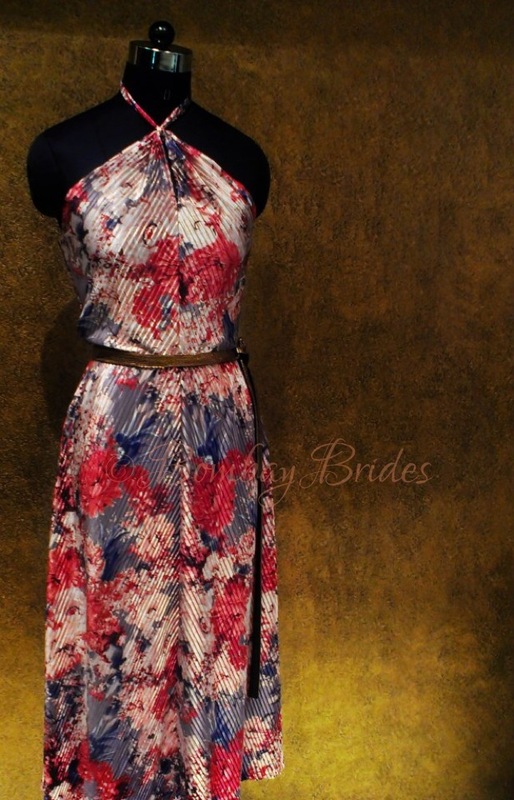 The styles are mostly formal and created in silk and proudly sport the Michelle Rodrigues label. 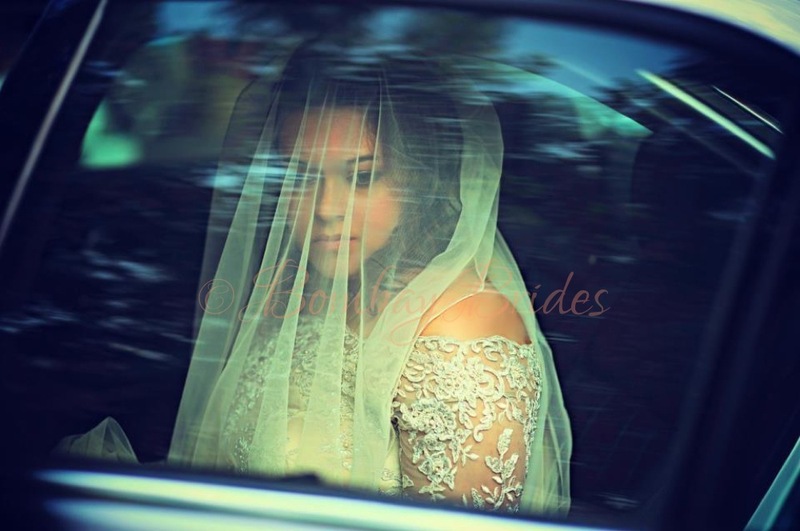 So next time you are stuck for a tailor who can bring your dream wedding gown to life, pay Michelle Rodrigues’ studio a visit or view her online portfolio and her Facebook Page and get in touch with her for a dress fit for your special day. 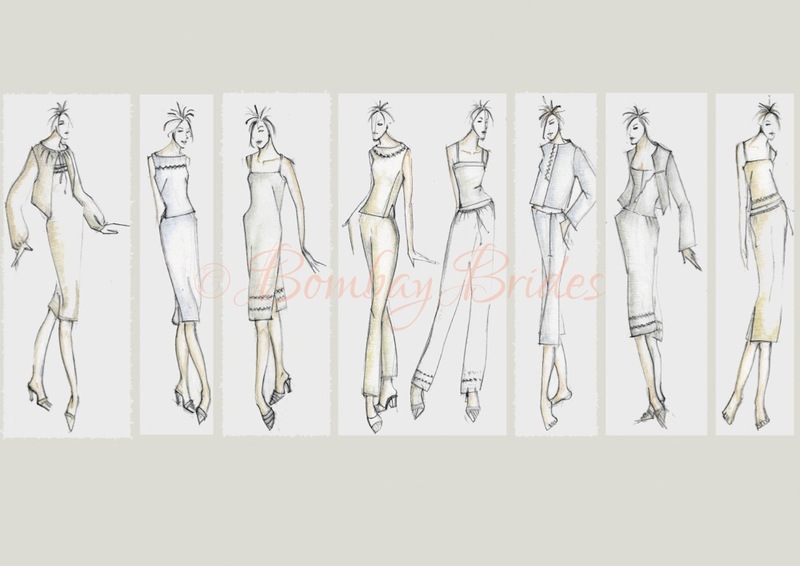 Are you a bridal seamstress or know one who should be featured on Bombay Brides? Check out the Wish to Feature Here page to know more about finding space on our blog. Thank you so much, Aditi, especially for saying hello. 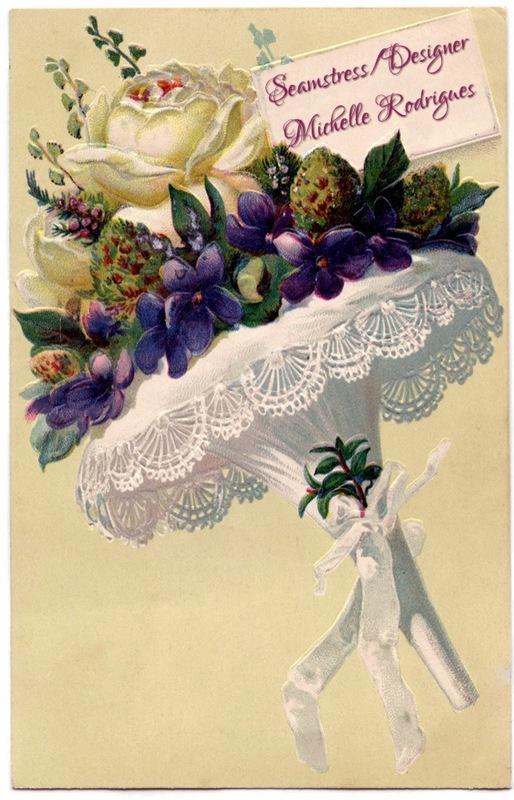 Very glad I got to know about a fellow bridal blogger like you out here! Hi Sandhya, the contacts provided in the post above are the best way to get in touch with Michelle. 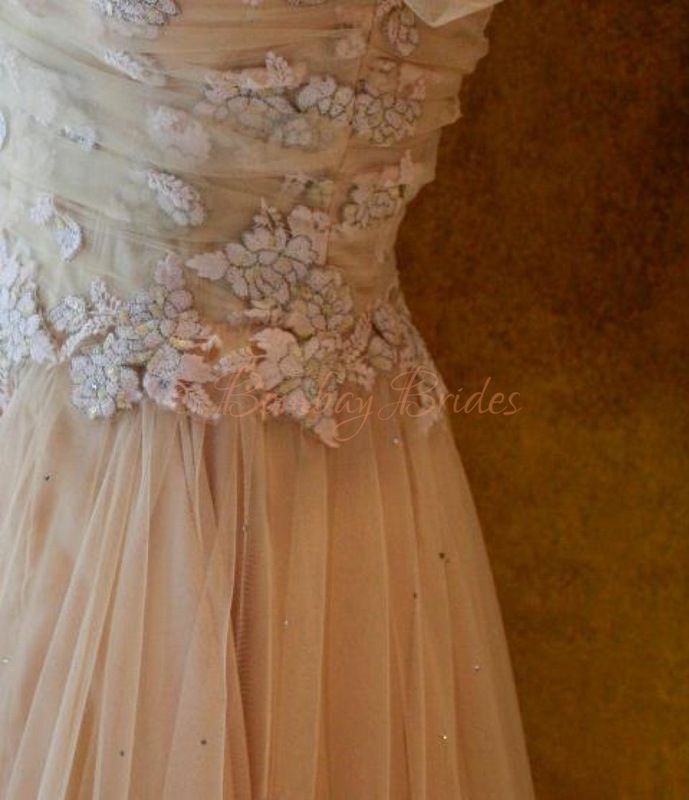 Hi , I am looking for a bridal gown for my wedding.. can you please help me out with it. 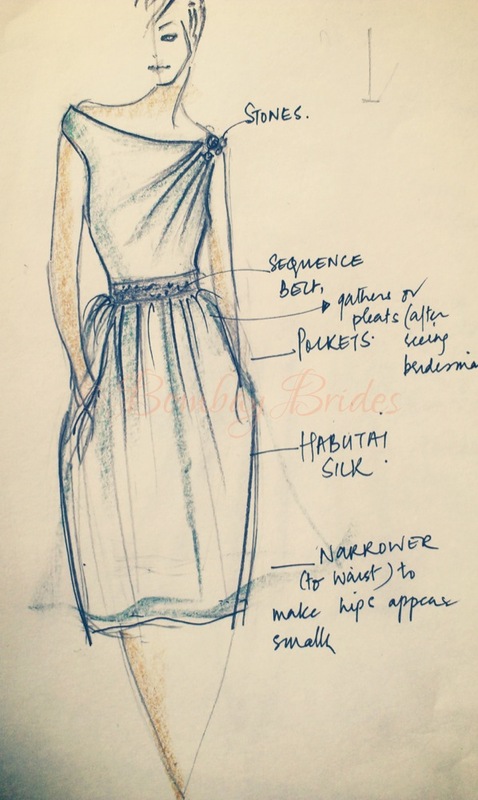 This entry was posted on June 19, 2013 by Haellii in Bridal Vendors and tagged Bandra, bridal designers, bridal tailors, Christian, Indian Christian wedding, lace, Mumbai, seamstress, wedding gowns, weddings.